Grand Canyon University has long stressed open dialogue with police leaders and west Phoenix neighborhood activists to foster a safer community around its growing campus. On Thursday, that commitment to public safety deepened as Phoenix Police Chief Daniel Garcia and City Councilman Daniel Valenzuela joined GCU CEO Brian Mueller at GCU Arena to announce a five-year, $1 million crime-suppression partnership considered the most significant of its kind in the city’s history. 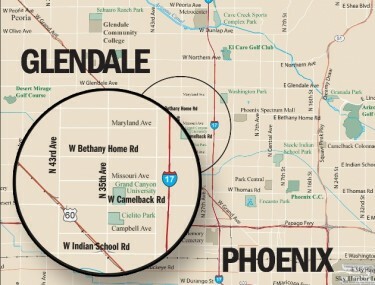 As part of the GCU Neighborhood Safety Initiative, the University will pledge $100,000 annually through 2017 to support Phoenix police crime-suppression programs in the area from Indian School Road to Bethany Home Road between Interstate 17 and 43rd Avenue. City officials will match the funds annually. Grand Canyon University CEO Brian Mueller said Thursday that the NSI partnership is accelerating GCU's community development efforts in its surrounding neighborhoods. Mueller spoke enthusiastically about how the GCU Neighborhood Safety Initiative will strengthen local businesses, link west Phoenix families to affordable college educations at GCU, and enhance the overall character of the area. Phoenix police from Cactus Park Precinct said the funding will cover overtime to augment patrols, providing 58 additional man hours on average each week for proactive enforcement. The added funds will enable officers to go beyond responding to emergency radio calls. GCU Neighborhood Safety Initiative operations could include delegating “saturation patrols” to beef up police visibility and using unmarked or undercover police to crack down on crime in neighborhoods around campus. Enforcement efforts will be determined on a weekly basis and through feedback from a steering committee that will include police, GCU staff, neighborhood activists and stakeholders. In addition to GCU’s annual funding, the University also donated 10 police bicycles to Cactus Park Precinct to help officers patrol areas where squad cars won’t fit, or where officers would prefer to have a stronger element of surprise. The Neighborhood Safety Initiative picks up where a federal Department of Justice grant left off in December. For five years, the DOJ’s “Weed and Seed” program targeted crime and blight in the same area, commonly known as Canyon Corridor. Community leaders credited the federal funding as critical to reducing crime in the area and empowering residents to take back their streets. Chief Garcia, who came to Phoenix from Dallas Police Department last year, heralded the GCU Neighborhood Safety Initiative as a partnership that could be duplicated in other parts of the city. Enrollment at GCU’s ground campus is expected to increase by 1,700 to nearly 7,000 by next month when students return for the Fall 2012 semester. The University is in the midst of a $313 million capital improvement overhaul that includes GCU Arena, dorms, classrooms and other buildings expected to enhance the character of the surrounding community. Public safety remains a key focus for University leaders. GCU officials anticipate that nearly 15,000 students could attend classes at the ground campus in three years, according to enrollment projections. As part of the GCU Neighborhood Safety Initiative, monthly reports on arrests and reported crimes from the targeted area will be compiled for the public, in addition to quarterly financial reports. 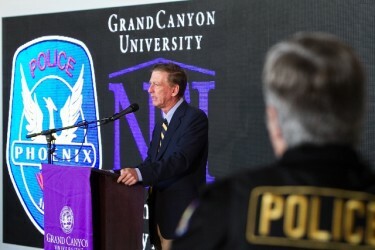 Phoenix police Lt. Ben Leuschner said the funding provided by GCU will enable police to concentrate on specific areas or crimes rather than from driving from radio call to radio call. Funding provided by GCU and matched by the city will pay for police overtime primarily. Leuschner, a Cactus Park Precinct resource lieutenant who oversees neighborhood enforcement teams and community-action officers, said drops in crime stats will play into measuring the success of the program. But with crime, perception is reality – and the police department remains focused on making sure residents feel that their neighborhoods are safer. GCU already allows Phoenix police officers space at the campus public safety office to park squad cars and write reports. That will continue as part of the program and the University will also provide community space for meetings with police on the GCU Neighborhood Safety Initiative. Leuschner, who came to Cactus Park Precinct toward the end of the Canyon Corridor Weed and Seed program, said GCU’s safety initiative will benefit the entire neighborhood. Phoenix Police is also expected to provide training for GCU personnel on security issues to help further protect students and staff. Hopefully part of the initiative program will be used to find project like the “PrePol” project. This is a project which suggests that computers could be better than seasoned police analysts at predicting when and where crime will strike next in a busy city. The progam tends to reduce bureaucratic procedures and keeps officers on the street. Where police used to sit in daily meetings to plan where to patrol, they can now spend more time actually out on patrol, since the computer’s doing the planning. The technology was previously tested in Santa Cruz, California. It has now been expanded to six Los Angeles areas inhabited by 1.1 million people, and is being expanded to other cities.